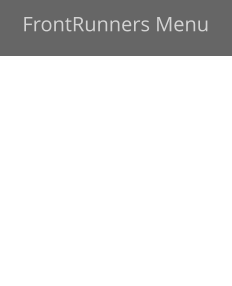 Head Coach and founder of Front Runners Track Club which was created in 2016. Originally from Montgomery, AL, Frank moved to Nashville as a junior in High School and graduated from Overton High School. He was a track scholarship recipient at the University of Memphis (formerly Memphis State) where he participated in long jump and sprints. Prior to starting Front Runners, Coach Frank was an assistant coach for Williamson Youth Track Club for 6 years and held the position of Assistant Head Coach the last 2 years of his tenure with that club. At one time, Williamson Youth Track club was arguably the premier track club in Middle Tennessee producing hundreds of national qualifiers, over 50 national medals (5 gold), a national record and over 15 collegiate scholarship student athletes. In its first year, 13 of 15 Front Runners qualified for AAU Junior Olympics. The season culminated with several top 3 finishes, multiple district and regional championships and one national medal. Just about every athlete obtained personal bests and improved each meet. This trend continued in 2017 with membership tripling in numbers. Entering our third year, we look forward to many more great seasons with many more great performances but more importantly, we look forward to the development of the student athlete on and off the track. Kevin Lewis is originally from Madison Heights, MI. He lived in Southern California before settling down in Nolensville, TN with his wife, Muriel and three sons, Morgan (11), Kaleb (6), and Josue (6). He and his family have lived in TN for a little over 10 years. As a family, they like to go on hikes at Radnor Lake, enjoy the scenery and waterfalls at Burgess Falls State Park, relax and unwind at Arrington Vineyard and love when their friends’ invite them to their lake house at Center Hill Lake. Kevin is an avid runner. His love for running started in 2009 when a friend asked if he wanted to run the Nashville Country Music Half-Marathon with him. He has run a total of 13 Half Marathons (in Nashville, TN, Washington, D.C., Detroit, MI, and Savanna, GA). His current PR is 1:45:08 and he is determined to try and beat it at the next half marathon he’ll run. He has also had the opportunity to run with a group of 12 guys to complete the Ragnar Relay (not once, but twice). Both times, the team impressively placed 3rd in their age group. Ragnar Relay is “a long distance, overnight running relay where the team conquers a course over two days and one night, and pushes their limits on little to no sleep.” The team ran a total of 196.1 miles from Chattanooga to Nashville in 26 hours. Kevin’s oldest son, Morgan, started playing sports at the young age of 4 and has not stopped since. He has had the privilege of being a coach for his son’s soccer, basketball, and baseball teams in the Nolensville recreational league. He is excited to be able to work with the Front Runners Track Club. Kevin enjoys seeing the children build new friendships with their teammates. He appreciates the time, effort, and dedication children put in towards learning the fundamentals of a sport and improving their skills. His goal is to let children have fun while at the same time helping them to build their confidence, build meaningful relationships, and teach them the importance of hard work. April Terry is an Arkansas native coming to Nashville by way of Lipscomb University, where she threw the shot put, hammer, weight and discus throws. At this NCAA Division I University, April still holds the hammer, weight, and indoor and outdoor shot put records. She was the 2013 Atlantic Sun Runner Up for indoor shot put, and placed 3rd the outdoor shot put and hammer in 2014. She is also a recipient of the James R. Byers Award, the highest honor given to student- athletes at the university, for her athletic accomplishments and active involvement on campus. In 2016, her first year coaching, April coached a Front Runner shot put athlete to the AAU Junior Olympic Games who finished 28th in the country in her first year in the event. In 2017, that number increased to 5, made up of 4 athletes throwing the Turbo Javelin and 1 returning shot putter/discus thrower. Among these 5 were 3 regional champions and 2 regional runner ups. April loves living in Nashville, and you can typically find her at a local restaurant, concert or art show. She enjoys meeting and connecting with people, and is always looking for ways to give back to the Nashville community. Kevin Lewis is originally from Madison Heights, MI. He lived in Southern California before settling down in Nolensville, TN with his wife, Muriel and three sons, Morgan (11), Kaleb (6), and Josue (6). He and his family have lived in TN for a little over 10 years. As a family, they like to go on hikes at Radnor Lake, enjoy the scenery and waterfalls at Burgess Falls State Park, relax and unwind at Arrington Vineyard and love when their friends’ invite them to their lake house at Center Hill Lake. Kevin is an avid runner. His love for running started in 2009 when a friend asked if he wanted to run the Nashville Country Music Half- Marathon with him. He has run a total of 13 Half Marathons (in Nashville, TN, Washington, D.C., Detroit, MI, and Savanna, GA). His current PR is 1:45:08 and he is determined to try and beat it at the next half marathon he’ll run. He has also had the opportunity to run with a group of 12 guys to complete the Ragnar Relay (not once, but twice). Both times, the team impressively placed 3rd in their age group. Ragnar Relay is “a long distance, overnight running relay where the team conquers a course over two days and one night, and pushes their limits on little to no sleep.” The team ran a total of 196.1 miles from Chattanooga to Nashville in 26 hours. Kevin’s oldest son, Morgan, started playing sports at the young age of 4 and has not stopped since. He has had the privilege of being a coach for his son’s soccer, basketball, and baseball teams in the Nolensville recreational league. He is excited to be able to work with the Front Runners Track Club. Kevin enjoys seeing the children build new friendships with their teammates. He appreciates the time, effort, and dedication children put in towards learning the fundamentals of a sport and improving their skills. His goal is to let children have fun while at the same time helping them to build their confidence, build meaningful relationships, and teach them the importance of hard work. April Terry is an Arkansas native coming to Nashville by way of Lipscomb University, where she threw the shot put, hammer, weight and discus throws. At this NCAA Division I University, April still holds the hammer, weight, and indoor and outdoor shot put records. She was the 2013 Atlantic Sun Runner Up for indoor shot put, and placed 3rd the outdoor shot put and hammer in 2014. She is also a recipient of the James R. Byers Award, the highest honor given to student-athletes at the university, for her athletic accomplishments and active involvement on campus. In 2016, her first year coaching, April coached a Front Runner shot put athlete to the AAU Junior Olympic Games who finished 28th in the country in her first year in the event. In 2017, that number increased to 5, made up of 4 athletes throwing the Turbo Javelin and 1 returning shot putter/discus thrower. Among these 5 were 3 regional champions and 2 regional runner ups. April loves living in Nashville, and you can typically find her at a local restaurant, concert or art show. She enjoys meeting and connecting with people, and is always looking for ways to give back to the Nashville community.